This former coaching inn offers classic country house charm, boasting bedrooms with exposed beams and four poster beds, and an award-winning restaurant. It is set in the heart of the Oxfordshire countryside in Woodstock, overlooking the village square and just moments from Blenheim Palace. This offer includes a half board basis so you can enjoy award-winning food every morning. 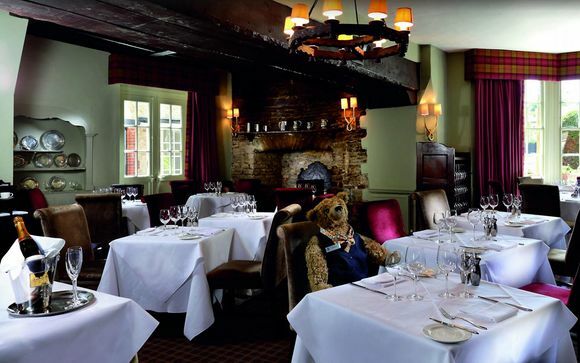 Macdonald Bear is situated in the heart of the Cotswolds, making it an ideal base for excursions throughout this beautiful part of England. Located in the picture-postcard village of Woodstock, this charming market town is the perfect place to escape the rat race and enjoy life at an altogether slower pace. 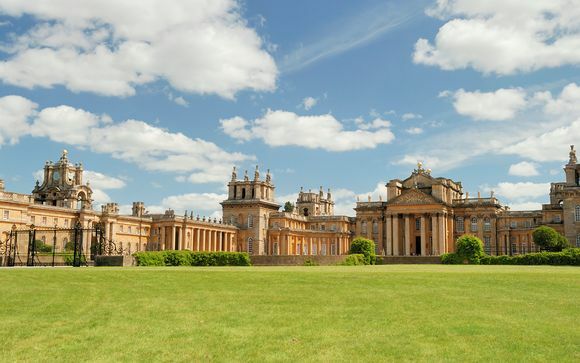 Blenheim Palace (0.2 miles): Step inside one of Britain's finest palaces and you'll see the State Rooms, filled with exquisite examples of superb craftsmanship and priceless treasures, collected over three centuries. Outside, revel in the beauty and tranquillity of the landscaped grounds. The Pleasure Gardens welcome young visitors and families with special activities throughout the seasons. To round off your visit, there's delicious food and a shop full of beautiful gifts too. Walking: The 102-mile Cotswold Way walking trail follows the Cotswold Edge escarpment from Bath in the south to Chipping Campden in the north. Oxford (9 miles): Roam the historic city of Oxford and marvel at the stunning architecture, or linger in the city's many shops and museums. Bicester Village (13 miles): High-end shopping outlet full of luxury fashion, homeware and beauty brands. With over 130 stores this is a shopper’s paradise and attracts many tourists all year round. 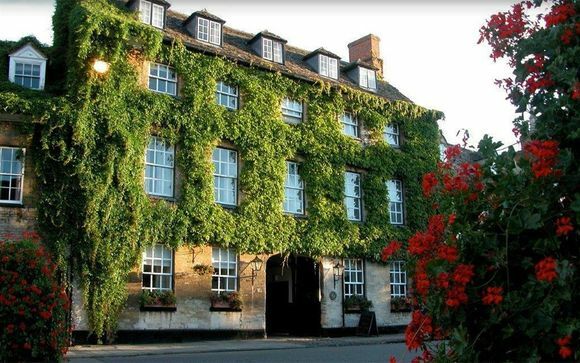 This charming hotel in Oxfordshire is perfect for a relaxing retreat. 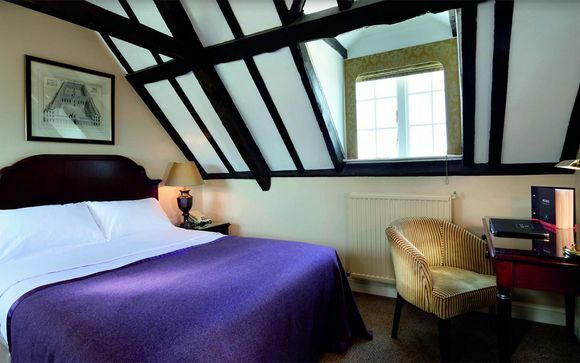 Set in Woodstock, in a former 13th century coaching inn, it combines charming original features with a touch of modern luxury. Each of the bedrooms is elegant and individually styled -some with four poster beds or deep soaking bathtubs. The suites were once frequently used as a romantic getaway by Elizabeth Taylor and Richard Burton, so you can be assured of their luxury! The award winning restaurant serves fantastic seasonal dishes using locally sourced, organic produce alongside an impressive wine list. This classic coaching inn is on the prettiest street in Woodstock. With its big sash windows, wide coach arch and gabled roof, it is a landmark feature of the town. This is a lovely place to visit even without the major attraction of Blenheim Palace almost on the doorstep. This offer is based on a Classic Room. Classic bedrooms are full of character and comfort with luxury bedding and bathrobes to sink into after a busy day. This offer is based on a half board stay (breakfast & evening meal in the main restaurant - drinks excluded). The award winning restaurant serves the finest British cuisine using locally sourced, organic produce wherever possible. An excellent selection of fine wines is available to accompany your meal in this elegant setting. For a less formal dining experience, sample the delicious, light dishes on offer in the bar or lounge with a freshly brewed tea or coffee, whilst you enjoy views across the market square. our contract will be with the provider of the accommodation and not Voyage Privé. Voyage Privé acts only as agent for the accommodation provider. Please read our booking conditions before confirming your holiday.